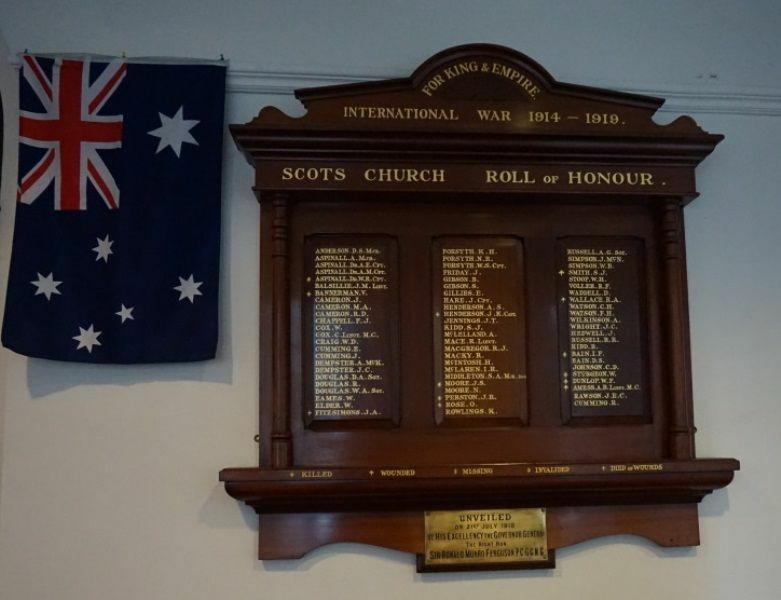 The Governor-General Sir Ronald Munro Ferguson, who was accompanied by Lady Helen Munro Ferguson, at the conclusion of the forenoon service at Scots' Church, Church Hill yesterday unveiled a roll of honour to members of the congregation who have enlisted. On the honour roll of polished cedar were 68 names. 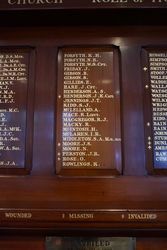 Two of the number have won the Military Cross and 11 have been killed. 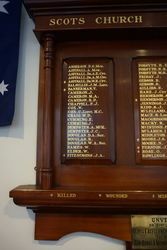 In unveiling this roll of honour to those connected with this congregation," his Excellency said, " I dedicate it to the glory of God and the memory of those who have fallen, those who have been wounded and have returned and those who are about to serve in our renowned Australian divisions. 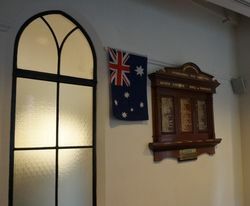 It is fitting that Scots Church should record the names of her sons who have answered the roll call—a church which represents a people well known in military annals for many centuries, a race which followed the fiery cross in 1914 as of yore and now has wattle and maple, and many another badge on its caps alongside its ancient symbols of duty and devotion. These men have renewed the ancient sacrifices of their forefathers on the altar of liberty. We honour them. They have brought great honour to us when all that Christianity stands for is put to the touch of winning or losing it all." Sydney Morning Herald (NSW), 22 July 1918.
International War 1914 - 1919. 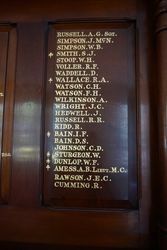 Scots Church Roll of Honour. 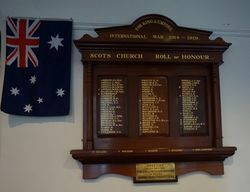 Unveiled on 21st July 1918 by His Excellency the Governor General the Right Hon. 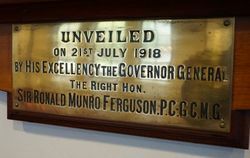 Sir Ronald Munro Ferguson. P.C. G.C.M.G.